IT’S PEANUT BUTTER JELLY TIME!!! Actually, scrap that, this nut butter does not need any jelly to make you want to do the food-induced happy dance. The team at Legendary Foods sent me samples of all their nut butters as part of their Healthy With Diabetes Challenge sponsorship, so I did a full taste test of all five nut butter flavors and tested how they affected my blood sugar. I generally like nut butter and consider it a healthy fat, so I’ll often include it in my meal plans. However, I usually stick with plain nut butter since most flavored brands I’ve come across are stuffed with sugar, evaporated cane juice, agave syrup, coconut sugar, oat sugar, or similar sugar carbs. Those are practically candy bars in a jar. Nooo thank you, not in a product I consume on a regular basis! 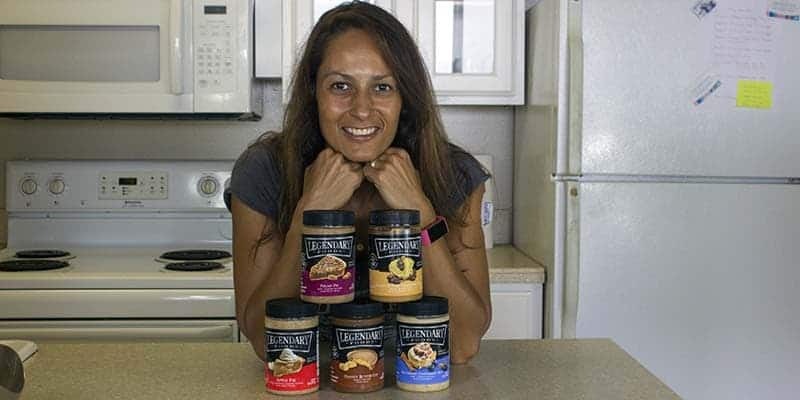 The Legendary Food Nut Butter is different because it’s sweetened with Stevia (which is my favorite sweetener because it has no impact on blood sugars) and Erythritol. Erythritol is a sugar alcohol, and can potentially affect blood sugar. In addition, the nut butters quite frankly taste too good to not be little blood sugar bombs, so I had to test their blood sugar impact for myself. I obviously don’t go around eating peanut butter by itself (ok, I do sometimes…), but usually include it as part of a meal. Peanut Butter Chocolate Chip Nut Butter: This is a smooth peanut butter with chocolate swirls and it tastes AMAZING! The jar claims that it should have whole pieces of chocolate but I didn’t find that to be the case. I think the chocolate chips melted into swirls in the California heat wave but I don’t care. The taste was still on point! Apple Pie Almond & Cashew Nut Butter: This one was just naughty and I had to hide it in the back of the fridge to not eat it all right away. It’s not a firm butter like the others but has these crunchy flakes of dried apply. YUMMY! It went quite nicely with my protein pancakes. Peanut Butter Cup Nut Butter: This is a firm smooth peanut butter whipped with cocoa powder to give it that peanut butter cup taste. I mixed it with both Greek yogurt and cottage cheese, and I highly recommend it. One thing to note is that they are all quite sweet, so if you don’t like that, they may not be right for you. I like it, but I found that they were best straight out of the fridge. If I let them get warm, the sweetness could get a little too much. I always store my nut butter in the fridge anyway so that was not really an issue for me. As a comparison, my regular unsweetened crunchy peanut butter has 95 calories, 8 g fat, 4 g protein, and 3.5 g carbs (2 g net carbs). As you can see, the numbers are very similar, but I still recommend you read the nutrition label before ordering your nut butter (or taking your insulin). 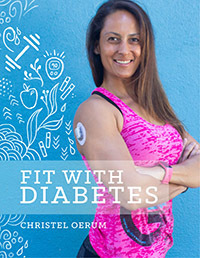 To test this, I had a tablespoon of my favorite flavor, the Peanut Butter Chocolate Chip Nut Butter, with nothing else one afternoon, just to see what it would do to my blood sugars. 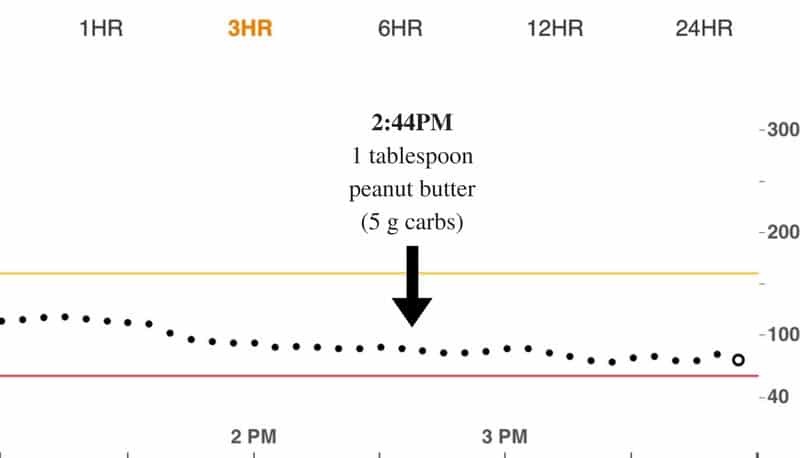 I had 0.5 units of insulin on board (IOB) from lunch but didn’t bolus for the 5 gram of carbs in the nut butter. I didn’t bolus because I had IOB and because 2 of the 5 grams of carbs are fibers, so net-carbs were 3 gram, too little to bolus for at that time. Below you can see what happened to my blood sugar after eating tablespoon nut butter at 2:44 PM. Nothing! It dropped a little, but that would be the left over IOB from lunch. This is what I want to see if I am eating a product that claims to have no added sugars! In general, I didn’t see any blood sugar impact when I ate the nut butters, except what I would normally see from the meal where I included the nut butters, so I’m pretty confident in my assessment it has minimal blood sugar impact. 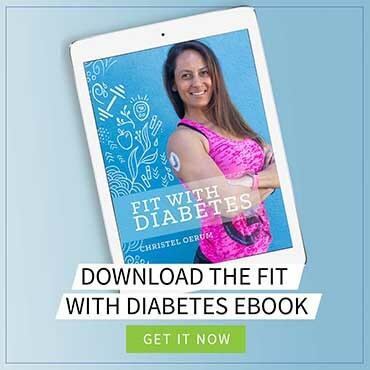 You should, of course, be aware that peanut butter (like any other fat) will delay the release of glucose into the blood stream, and adjust your insulin accordingly if you include them in a high-carb meal. I really like the Legendary Foods nut butters. They taste fantastic and have practically no effect on my blood sugar. I love plain peanut butter as well, but the added flavors take it to a completely new level. If there is a downside to the Legendary Foods nut butters, it is that they can be dangerous to have in the fridge when you have the munchies (or a low blood sugar). Hi Barbara, it’s all in the post above. You can use the link and discount code at the end of the post to order. I’ll actually be discussing gut health a little in the upcoming challenge. But if you have issues with bloat a good place to start is by cutting out artificial sweeteners and slightly up your fiber and water intake.